Paul Kirk sent me a photo of a piece he has in the elusive Imperial Hexagon and Cane (#502) pattern. I've not seen a piece myself, but here's proof they do exist. This is an 8 1/4-inch bowl which Paul says is iridized both inside and out with a deep, rich marigold. 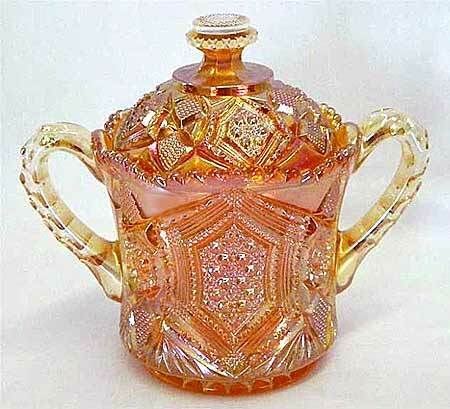 Last updated 12/27/2017 This marigold covered sugar bowl sold at auction in 2012 for $190. Photo courtesy of Seeck Auctions. In 2017, another sugar, with a base chip, sold for $55.